I know it’s been out a while, but I’m watching Steal this Film II and I’d like to heartily recommend it. I thought it would be skinny swedish Piratebay users talking about how horrible corporate Hollywood is… but it’s a very intelligent exploration of media and copyright buttressed by interviews with smart people I’ve depended on and read over the years. The film begins very historically, framing the ‘copy’ as an essential unit of civilization and communication. No one’s getting rich off this movie, but I made a point of donating to the creators. Check out this interview with the head cheese behind it: Jamie King of the League Of Noble Peers. Then get the movie here. Q. Why is your film copyrighted? A. So that you can steal it. Of course there’s more to say about this, but we’re sure you can figure it out. Q. 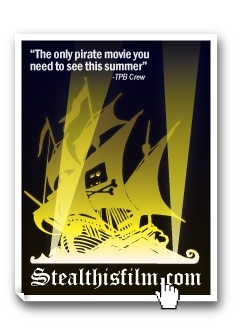 How many downloads have you had of STEAL THIS FILM? Q. How many people have seen STEAL THIS FILM? A. About 4.86m, which is about 48.6 times as many as we ever imagined. Q. Where do you get these numbers from? Q. Did you make a lot of money out of STEAL THIS FILM I? A. No. To be honest we didn’t even make enough to make STEAL THIS FILM II, but here’s hoping for the future!